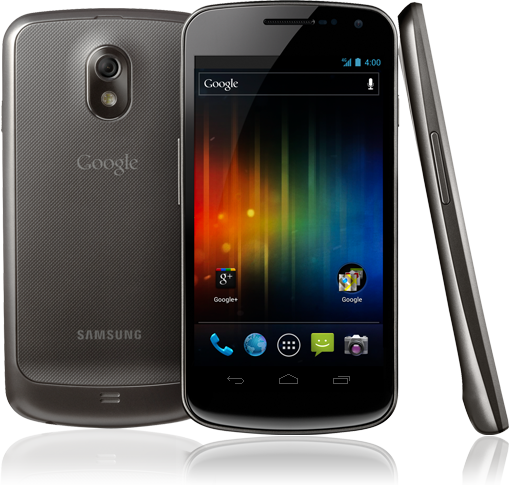 Although the Samsung Galaxy Nexus – the first device to feature Android 4.0 (Ice Cream Sandwich) has yet to launch Stateside, it can be found on the UK market, and the comparisons between it and others on the market has inevitably begun. AnandTech has kicked things off with a few benchmark tests, which scrutinize a device in key areas, scoring points depending on capabilities, and are then subsequently compared with other smartphones on the market . Despite the great early sales figures allied to critical acclaim, Apple’s treasured iPhone 4S and iOS 5 do fall short in a couple of key areas. 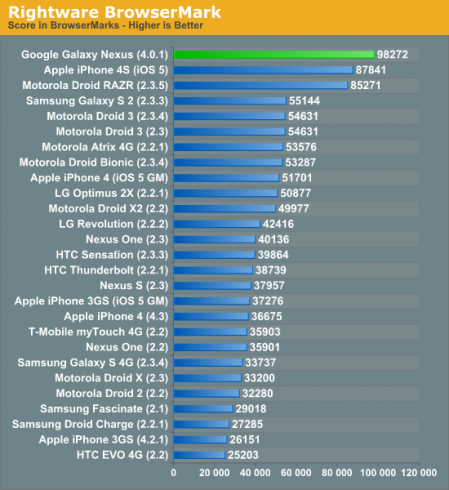 The #1 spot for the Galaxy Nexus in quite a few of the tests is largely attributable to Ice Cream Sandwich as opposed to the device itself, which while very competitive in terms of processor speed / GPU, is nothing astronomical. The graph above represents the tested browsing speeds of Samsung’s latest offering. even though the difference is said to be minor, such day-to-day tasks must be as fluent and easily executed as possible. As you can see, it almost doubles the score of the Galaxy S II, which itself is a very good device – certainly not what you would call slow. Although the Galaxy Nexus dominates on most fronts, it doesn’t have everything its own way. The iPhone 4S, with its dual-core A5 chip, outdoes its Samsung rival in the GPU loading stakes – pretty important to ensure smooth gameplay. Then again, surely the speed of the essentials – email, aforementioned browsing and the like should be held in higher regard than potential for gaming? Having said that, with smartphones fast-becoming the new handheld console, one suspects many look at the gaming potential in a smartphone just as much as anything else. The news doesn’t help our American following, who will now be even more eager to get their hands on what appears to be a very good device running the latest mobile OS from the Big G.
Let’s just hope the wait isn’t much longer.